डीजीसीए ने इसे काफी गंभीरता से लेते हुए कहा है कि बार-बार दिशा-निर्देश जारी किए जाने के बाद भी एअरलाइनों ने इनका पालन नहीं किया है।. As we observe Martyr’s day today, let us remember the sacrifice of millions of martyrs – freedom fighters, soldiers, activists and everyone who worked and laid their lives for betterment of our nation. Without their sacrifice, we wouldn’t be where we are now. Mahatma Gandhi is not only the father of our nation but a true global citizen who wanted peace between every society and nation. His death will be a constant reminder for the need of real tolerance and understanding in our diverse nation. Let us join hands in the spirit of ‘bhaichara’ which he preached and walk in the path of truth and justice that he showed. Today, we salute all these martyrs and aim for a peaceful, equitable and just nation. Ministry of Finance Is Not Surprised On U S Decision Of Tapering USD 65 billion.India’s economy is better prepared for the consequences, if any, of the taper Becouse foreign exchange reserves stands at USD 295 billion and Current Account Deficit is now expected to be below USD 50 billion. However Government of India and the Reserve Bank of India will continue to remain vigilant and will take whatever steps are necessary to ensure that there is stability in the financial markets. Ministry of Finance Said That US Decision On Tapering Of purchase of mortgage-backed securities and longer-term treasury securities Was expected So It Is Not A Surprise and should not in any way surprise or affect the Indian markets. The Central Government has taken note of the US Federal Reserve’s decision to reduce the level of purchase of mortgage-backed securities and longer-term treasury securities to USD 65 billion per month as against USD 75 billion per month. This decision was expected and should not in any way surprise or affect the Indian markets. However, it may be noted that USD 65 billion is not a small sum and will continue to infuse a large amount of liquidity into the world markets. The Federal Reserve has not announced a sequential taper and has made it clear that “asset purchases are not on a pre-set course” and that they will take “further measured steps at future meetings.” The Federal Reserve has also made it clear that the result of the decision will be a “sizeable and still-increasing holdings of longer-term securities”. The Federal Reserve has also “reaffirmed its expectations that the current exceptionally low target range for the federal funds rate of 0 to ¼ percent will be appropriate at least as long as the unemployment rate remains above 6½ percent”. As Government has stated earlier, India’s economy is better prepared for the consequences, if any, of the taper. We have added to our foreign exchange reserves which stand at USD 295 billion. FDI and FII inflows continue to be robust, liquidity is comfortable, stronger regulations have been put in place in the capital markets, the investment cycle appears to have turned positive, credit demand from key sectors is strong, and WPI inflation has moderated. The Current Account Deficit which was earlier estimated at USD 70 billion is now expected to be below USD 50 billion in 2013-14. Therefore, there should be no undue concern over external factors. However, both the Government of India and the Reserve Bank of India will continue to remain vigilant and will take whatever steps are necessary to ensure that there is stability in the financial markets. The Prime Minister, Dr. Manmohan Singh and his wife Smt. Gursharan Kaur arrive at the Beating the Retreat Ceremony, in New Delhi on January 29, 2014. The Defence Minister, Shri A. K. Antony is also seen. 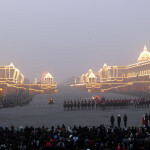 A view of the illuminated Rashtrapati Bhawan, South and North Block, during the Beating the Retreat Ceremony, in New Delhi on January 29, 2014. 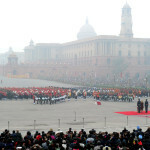 The Band performing at the Beating the Retreat Ceremony, in New Delhi on January 29, 2014. The President, Shri Pranab Mukherjee being received by the Prime Minister, Dr. Manmohan Singh, at the Beating the Retreat Ceremony, in New Delhi on January 29, 2014. The Defence Minister, Shri A. K. Antony and the Minister of State for Defence, Shri Jitendra Singh are also seen. The Prime Minister, Dr. Manmohan Singh unveiling the plaque to inaugurate the newly established National Waqf Development Corporation (NAWADCO) Ltd., in New Delhi on January 29, 2014. The Chairperson, National Advisory Council, Smt. Sonia Gandhi, the Union Minister for Minority Affairs, Shri K. Rahman Khan and the Minister of State for Minority Affairs, Shri Ninong Ering are also seen.